Maersk and IBM are now live with the early adopter programme for their blockchain-powered global trade platform, called TradeLens, involving 92 participating organisations from across the globe. The announcement follows a 12-month trial phase where more than 154 million shipping events were captured on the blockchain. TradeLens will be made fully commercially available by the end of the year. It all falls under a revised partnership model between IBM and Maersk after industry players had expressed worry over “too much Maersk control”. TradeLens, jointly developed by Maersk and IBM, is a platform aimed at promoting more efficient and secure global trade. It connects all parties in the trade ecosystem and enables them to interact efficiently and access real-time shipping data. The platform will also enable participants to digitalise and exchange trade documentation – anything from packing lists and shipping instructions to bills of lading and certificates of origin – all backed by a secure, immutable audit trail. Its trade document module, called ClearWay, will allow for the automation of various businesses processes, such as import and export clearance, with smart contracts ensuring that all required approvals are in place. The platform also allows for the integration with internet of thing (IoT) and sensor data to measure events like temperature control and container weight. Maersk and IBM believe the blockchain-based system will significantly improve efficiency in shipping, an industry still largely dominated by manual, time-consuming, paper-based processes. During a trial, the platform helped reduce the transit time for shipments to the US by up to 40%, saving thousands of dollars in cost. Among the 92 organisations already signed up are port and terminal operators, ocean shipping lines, customs authorities, freight forwarders and logistics companies. While today’s announcement marks the formal launch of the early adopter programme, about half of the participants have already been onboarded and are now using the platform. In fact, over the last 12 months, during which users have been trialling the beta version, more than 154 million shipping events have been captured on the blockchain-based platform. This includes data such as arrival times of vessels and container “gate-in”, as well as the exchange of documents. According to IBM, this data is growing at a rate of close to 1 million events per day. No banks are a part of the project at this stage, but they are “on our roadmap”, says Marvin Erdly, global trade digitisation leader at IBM Blockchain. Speaking to GTR, he says the project will likely starting piloting with financial institutions next year. “We are currently having discussions and workshops with a lot of financial institutions, both for trade finance and trade insurance, and we will continue to do that and uncover what those capability requirements are and likely have something out in 2019. It’s not something we are going to be doing by the general availability release, but it’s absolutely a critical part of our plans,” he says. The idea is that banks providing trade finance products will be afforded increased visibility of key events affecting their financing, as well as the digital documentation supporting the transactions. It is hoped that this will enable them to free up more capital to lend elsewhere. No joint venture Erdly emphasises that TradeLens is “definitely not a solution for Maersk”, but rather “an industry platform”. That’s why IBM and Maersk decided to ditch their original plan to form a joint venture to commercialise the platform, as announced in January. Maersk would have owned 51% of the company. But the announcement was followed by criticism, in particular from Maersk’s biggest rivals, who rejected the idea of joining a project that was not driven by the industry as a whole. “Some were worried about too much Maersk control,” Erdly says. “The idea is that you need to have a neutral industry platform. This is not a platform for Maersk, it is an industry platform that needs to be adopted by the industry. We announced we were going to form a joint venture, but we have since received feedback from many in the ecosystem. We did get some pushback, especially from other ocean carriers, who said if this joint venture cannot be more broadly distributed in the industry, it’s not a model they would find the best. We took that very seriously.” Instead, the parties decided to extend their existing collaboration model so that other participants can join as members of the platform, through agreements with IBM or Maersk. “It’s really a better way to drive widespread adoption,” Erdly says, adding that while AP Moller Maersk and IBM will continue to invest in the development of the platform, Maersk Line will be a participant just like any other in the network, on the same terms and conditions that others would sign up to. 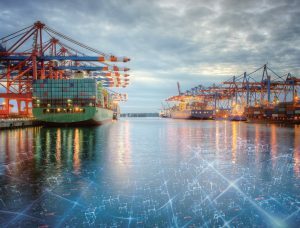 So far, IBM and Maersk have named only two other ocean carriers as current participants in the solution: Pacific International Lines (PIL) and Hamburg Süd. But, according to Erdly, the parties are in “active discussions” with rival shipping lines and are “very optimistic” that others will join “very quickly”. “The network is as important as the software product itself,” he explains. “The platform becomes more valuable as we add network participants. The most critical point for us is that we are able to bring on other ocean carriers, because that’s where we really get to expand the network.” To date the TradeLens network includes more than 20 port and terminal operators, including PSA Singapore and APM Terminals, a large number of beneficial cargo owners (BCOs), freight forwarders, transportation and logistics companies, as well as customs authorities in the Netherlands, Saudi Arabia, Singapore, Australia and Peru. After the commercial release, which is scheduled to take place by the end of the year, participants will be able to access the core platform through a subscription-based model. TradeLens will also host an “applications marketplace”, where – through APIs – participants can develop and offer value-added services and apps themselves. The post Maersk and IBM go live with global blockchain trade platform TradeLens appeared first on Global Trade Review (GTR).